Gone are the days of the regular shopping centre. MANY6160 is so much more. The three story co-operative space in Fremantle is home to a dynamic, eclectic mix of designers, artists and talented folk all focused on one goal; making Fremantle a more active and vibrant place. With the change of season, MANY 6160 has had a new influx of businesses rotate into the building, and launched their Winter Weekends series offering new opening hours (10AM to 5PM Friday-Sunday) and creative workshops by Studio Bomba to get the community involved. I was recently invited to a brunch and exclusive tour of the space alongside other Perth fashion, lifestyle and design bloggers. Champagne for breakfast? Yes please. The morning began with an introduction to the concept behind MANY6160 by detail’s Emma Bergmeier-Varian of dropstitch blog fame and the brains behind MANY, Nic Brunsdon of Spacemarket . Kate + Abel’s cafe provided delicious pastries and coffee to keep us fuelled up and ready to dig deeper into what some of MANY’s old school and newbie retailers had to offer. Here is my pick of the best. Hats, hats and more hats! The self taught milliner’s love affair with hats has seen them travel the world selling their craft – even featuring in Topshop in the UK. If you’re in need of new head piece, these two should be at the top of your list. Kate + Abel also stock hand made home wares, jewellery, books, magazines and trinkets. 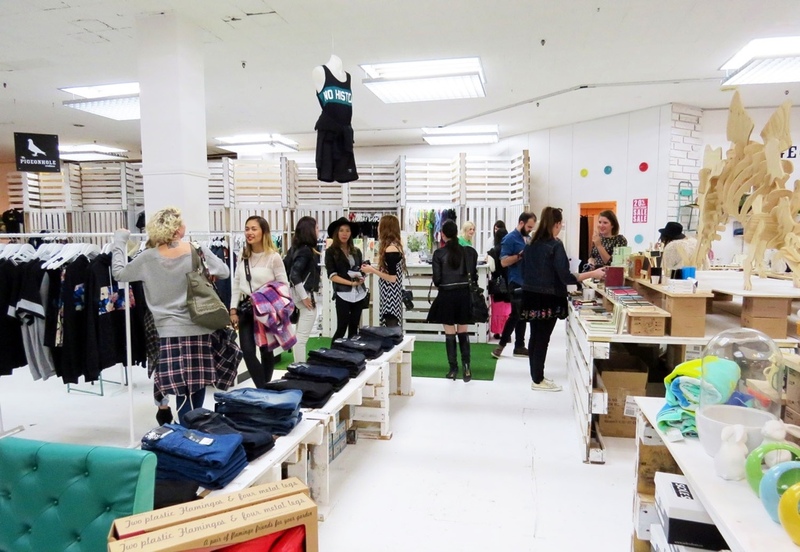 We all know and love Pigeonhole and it’s nice to see the quirky store settle into Fremantle. Pigeonhole is one of those shops where you can just about buy a gift for everyone you know. The store in MANY features new stock, and the best of past seasons. So luxe. High end fashion at its best. I was mesmerised by the lush, ornate fabrics and designs featured in the Antipodium MANY store. It’s one of those places I tend to daydream about where I’d wear such elegant pieces – hint hint for date night E, haha. the illusive femme picks: prints and patterns a plenty and structured, gorgeous jackets. If shoe heaven existed it would probably look like Hunter Store. Only the best quality and chic-est shoes make the cut, but that’s what you want, right? Hunter Store also stocks lavish jewellery, handbags and accessories, so if you’re on the hunt for something extra special, this is your place. the illusive femme picks: bite beauty “no nasty” lipsticks, delicate necklaces and gorgeous flats of course! Handmade beauty products designed with sensitive skin in mind? Hello Peaches and Clean! As you step into the P&C space you can just smell the fresh goodness. Beard toting hipsters, this is your spot – their specialty beard oil will keep your beard and skin lovely and soft. MANY actually had their foaming soap on display in the women’s bathroom – can I say it smelt divine. And majority of the range is vegan. the illusive femme picks: calming pillow spray, rose soaps and coffee exfoliant body scrub. Get lost, explore, hang out. The possibilities are endless! The second serve of my MANY6160 goodness is coming soon featuring the upper level of creative folk and local artisans. Great post. Interesting concept they have going there. Very Freo.